When you’re looking to fit a roof window, choosing the right kind of flashing can be equally as important to choosing the right window. 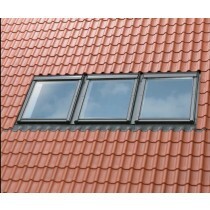 It is for this reason that Roofing Megastore stock the full range of VELUX window flashings. Designed to integrate your window choice perfectly into your roofing material, VELUX flashings ensure that your window is correctly installed. We offer two varities, which include standard and recessed. 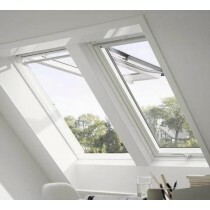 Each offer a 10 year VELUX guarantee. No matter which window design and combination you choose, VELUX’s specially designed flashings will ensure you can fit your favourite type of window design in your property. Once fitted, they allow for a weathertight installation of all VELUX Roof Windows with each design being tested under extreme weather conditions. If you would like to position your window in a recessed position to create a more sleek and understated appearance, recessed flashings are the perfect choice. Sitting 40mm deeper into the roof structure, they are ideal for conservation areas. Recessed installations also offer greater energy efficiency and when installed with the appropriate VELUX insulation collar, actually offer a lower certified U-value. By installing two or more identical VELUX roof windows along-side each other, you can add even more light to your room and add a unique character to your interior and exterior. With twin, coupled, triple to quattro flashings, no matter which window layout you choose there’s a flashing to suit it. Each choice covers a number of tile thickness and spacing between the windows. See our ‘Twin and Combination’ category for more! 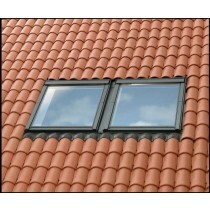 Each flashing design ensures efficient water drainage away from the roof around the window. Choosing the right product ensures that water will not become trapped and therefore reduces the chance of leaks. This does not only project your roofing material from the damage caused by resting water, but protects the interior of your home too. 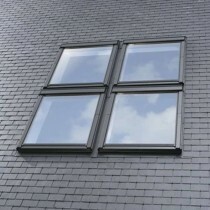 From plain tile to slate, we offer a selection of flashings to make fitting a VELUX roof window hassle-free. Whether it’s a centre pivot, combi design or flat roof. 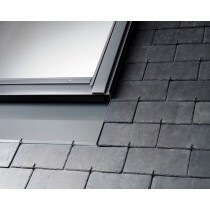 There are also options for interlocking tiles and slates, as well as profiled sheeting. We even offer flashings to suit corrugated sheeting and thatch! 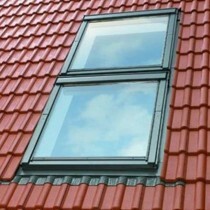 If you have questions about our range of roof windows, speak to our team by telephone or via the online chat. With over 40 years of experience in roofing, we’ll help answer your questions about roof windows. We will also help you pick the best skylight for your project for your project.